Have old home movies you want to preserve? Found family photos you’d like to share online? 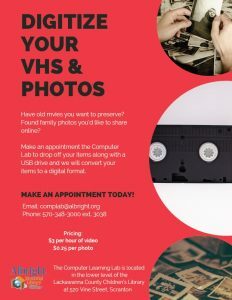 VHS Movie & Photo Digitizing is now available in the Computer Lab. Make an appointment to drop off your items along with an USB drive and we will convert your items to a digital format. Please note we cannot digitize copyrighted materials. To make an appointment, please contact the computer lab.